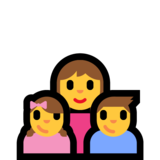 This is how the 👩‍👧‍👦 Family: Woman, Girl, Boy emoji appears on Microsoft Windows 10 Fall Creators Update. It may appear differently on other platforms. Windows 10 Fall Creators Update was released on Oct. 17, 2017.